Twenty-six funky letters and their corresponding realistic animal counterparts! 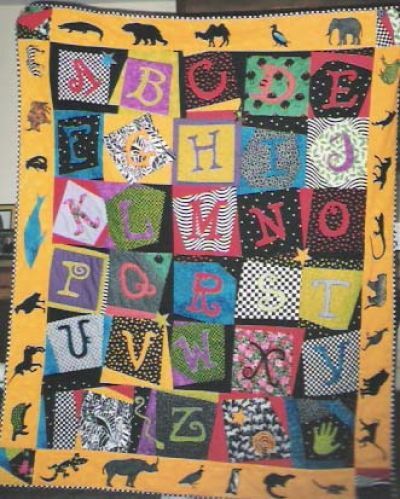 This cover quilt measures 41" x 58". To give you an idea of scale, the applique of the "M" is 5" square. 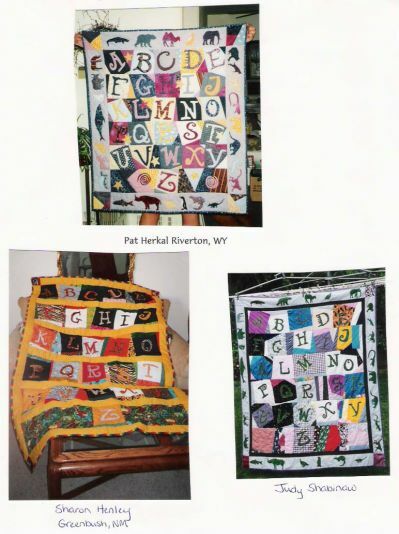 Some of the letters in this quilt are Madras plaids left over from the Fish Gumbo quilts. It looks hard, but the crazy quilt background is just flip-and-sew easy! I explain it clearly in the instructions. You could easily spell out words like "NO SMOKING" or someone's name to make a quilted sign. 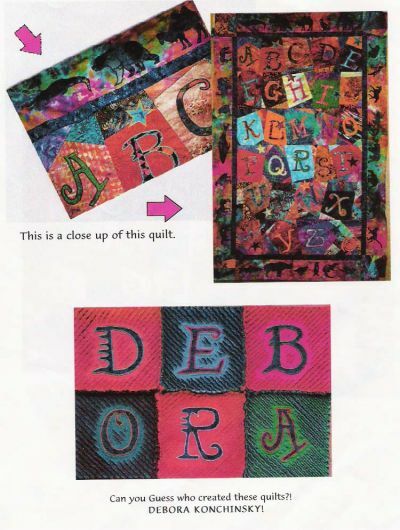 The instructions include all the information you need to make a quilt wall hanging similar to mine. You have the freedom to rearrange all the designs to make it your own because all the drawings are complete figures (even if they are hidden behind another figure)...If you have never made a quilt before, we have six free videos on our website which is on the pattern, or you can go to youtube.com/critterpat to watch right now. 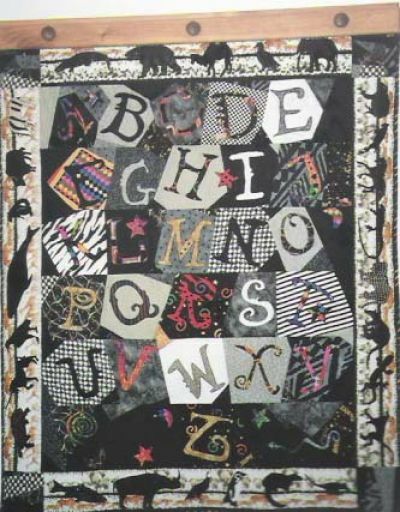 One quilter used a photograph of her alphabet quilt as her Christmas card one year. Her friends had to figure out why she sent them this photo. Then they realized that the quilt had no "L". Get it? ....Noel. In 2014, I was experimenting with the 1996 ALPHABET pattern with my hand dyed wools and lots of embroidery threads. I have learned the principles of hand spinning my own yarn from YouTube videos, and used my thick and thin yarn in stripes on the border. 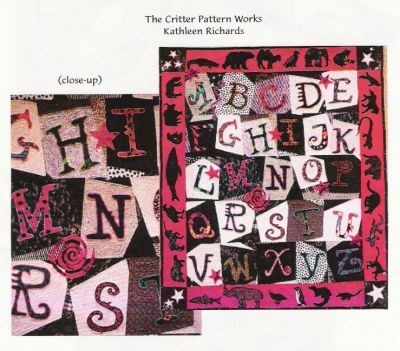 The new pattern with lots of color close up photos, is called Woolly Alphabet. This photo shows what it looked like before quilting on my home sewing machine. The link to the finished pattern and quilt are below. These photos are from our fan club members. 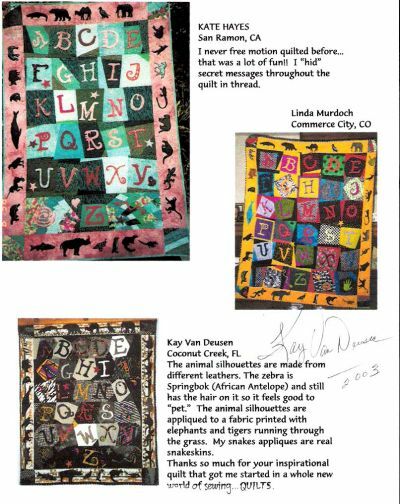 We have lost the names that go with the quilts. If you see a quilt that you've made email us so we can give you credit.